My mom loves, I mean loves Billie Dee Williams! She would watch all of his movies over, and over again, including "Mahogany" and of course "Billie Holiday" movies. As I layed on her lap and watched Donna Ross bring the jazz legend to life on screen, I became completely amored with Billie Holiday songs. I started to read every book and listen to every tape that Billie Holiday was singing on. So when I heard that the JuJu Bag was doing a production of "Lady Day at Emerson's Bar and Grill", I decided that I couldn't miss it. Sharon Martin gave an eerie performance as she channeled Billie Holiday in about a two hour set. She was joined by a stellar cast to help round out this very realistic performance. 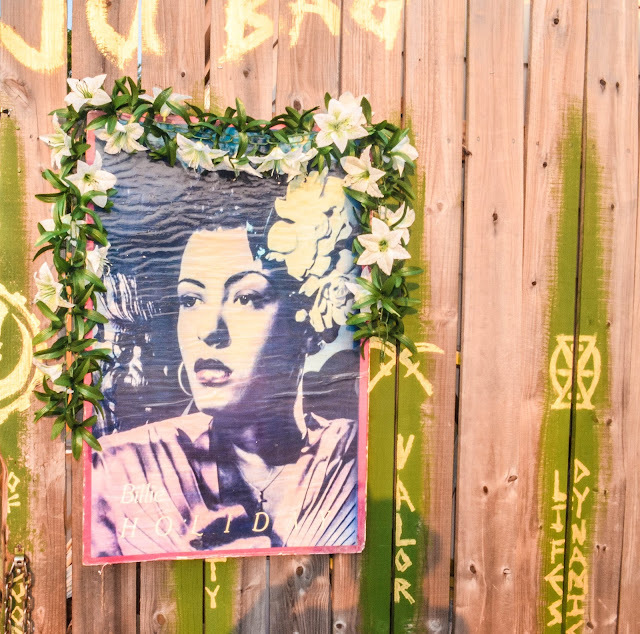 So if you are a lover of Bille Holiday or just love to hear live jazz music, then do yourself a favor and make your way down to the JuJu Bag Cafe for a truly jazzy treat!